The last Gigabyte gaming laptop we reviewed was last year’s halo device, the AORUS X9. Back then, we praised its winning combination of a 4K display, mechanized keyboard and solid performance, we said that it would “almost-certainly going to be the gaming laptop you’ll wish you had”. In a lot of ways, that’s still the case. It’s only been a couple of months - and the X9 hasn’t exactly lost its shine. However, high-end halo products aren’t the only laptops that Gigabyte make. They also make products for the rest of us. Well, some of the rest of us. The new AERO 15 is almost $2000 cheaper than the AORUS X9 was. This isn't an insignificant price-drop but I’d still hesitate to call it affordable. Ultimately, it’s playing in the same space that most gaming laptops do. It's a slim, sharp and neon-lit glowing-death machine with desktop-grade specs and GTX 1070 under the hood. Even if it a little by the numbers, the AERO 15 does a more than serviceable job of holding its own and holding its edge against its fellow 8th-gen powered competition. Ports: Thunderbolt 3 (Type-C), USB 3.1 Gen1(x2), USB3.1 Gen2, HDMI 2.0, mini-DP1.4, RJ-45, Audio Jack Combo, SD Card (UHS-II), DC-in Jack. For those who haven’t dabbled with Gigabyte’s gaming fare before, it feels fair to say that they sit pretty close to Razer in their overall tone and high-level of execution. They live and breath the same distinct sense of style like a pair of metal-heads who listen to all the same bands. Both touts sleek minimalism wherever they can afford it and fit into the mold of a classic neon-lit glowey-death machine without too much trouble. In addition, and in terms of broader design language, there’s also (obviously) a lot of shared genetics between the AERO15 and AORUS X9. 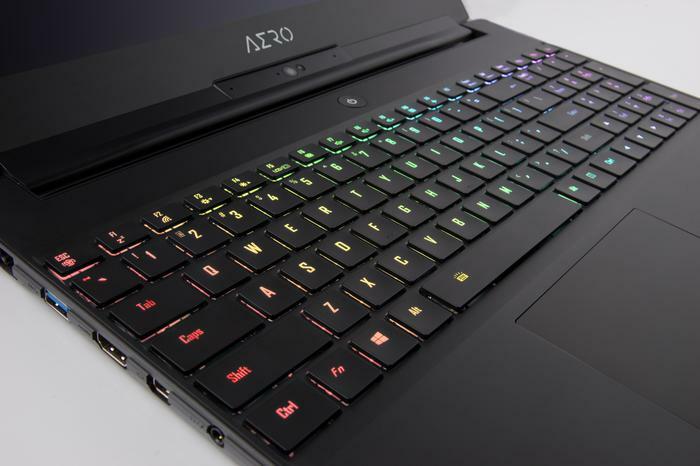 Like the X9, we also found that the AERO 15’s keyboard held a satisfying and punchy responsiveness to it, and came with fully customizable per-key RGB lighting (powered by Aorus Fusion software). Again echoing the X9, the fans on the AERO 15 are largely directed away from the user. However, interestingly, Gigabyte have opted to slip the laptop’s webcam below the screen rather than the usual. They aren’t the only ones experimenting with this particular layout - but they do suffer the usual drawbacks. The webcam is looking up at you rather than at eye-level, which means it tends to pick up a lot of chin and can sometimes make video calls a little awkward or at least a little more awkward. Still, in terms of form-factor, the thing we have to say about the AERO 15 couldn’t be more different to those we said about the AUROS. With the latter, our review highlighted that it really was more portable in theory than it was in practice. Thankfully, the AERO15 makes for a stark comparison here. It offers real, tangible portability on this front that the X9 just doesn’t. There's still a lot of room for improvement here - but the difference is night and day. The AERO 15 is much easier to carry around with you, even if it's not quite a Macbook Air. It feels only just a little bit heftier than most performance-focused notebook PCs out there. Another point of difference between the design of the AERO 15 and X9 is concerns audio. The X9 featured a set of two 2-watt speakers and two woofers. The AERO 15 drops the latter - and sounds worse for it. That said, I wouldn’t necessarily say it sounds bad. It does come with Dolby Atmos sound - which is always appreciated despite many games not really supporting the feature to its fullest. Outside of that, the AERO 15 is generally a delight to look at. When it comes to the display, it shores up as super-sharp, super bright and proudly boasting ultra thin-bezels that prove gorgeous to behold. When we played Sea of Thieves on this thing, the colors and lighting effects really popped out in a way that they wouldn’t on a lesser display.That said, playing games like the former and Kingdom Come: Deliverance did cause the fans inside the AERO 15 to really kick up a fuss. Less intensive titles like Warframe and Overwatch didn’t quite hit the same exceptional watermark. Again, I wouldn’t say they looked bad, but they didn’t look significantly better than they usually did on my regular LG gaming monitor. In terms of everyday performance, we came away generally pretty satisfied by what the AERO 15 served up. 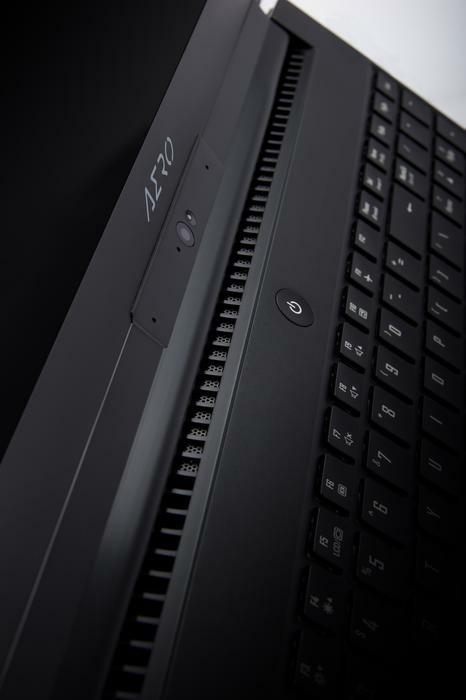 As the spec-sheet indicates, it’s a machine that boasts an eighth-gen Intel Core i7-8750H, Nvidia GeForce GTX 1070 and 16GB of DDR4 RAM - and it delivered on those dot-points in compelling form. 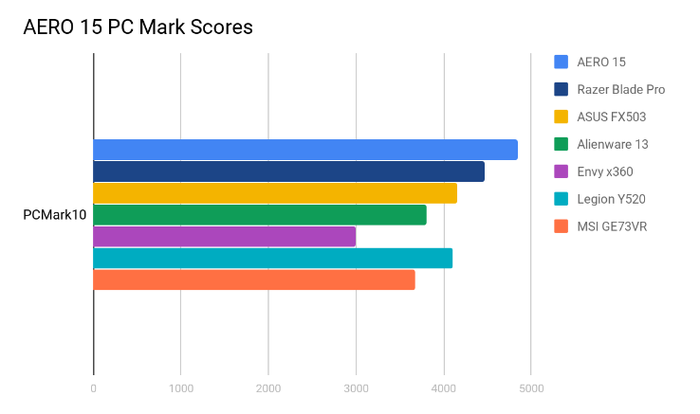 When it came to PCMark’s Work benchmark, it outperformed most of the other laptops we’ve reviews in recent months including the new Razer Blade Pro and ASUS’ FX503. Realistically though, the biggest culprit here is probably the 8th-gen Intel Core processor that the AERO 15 runs on. 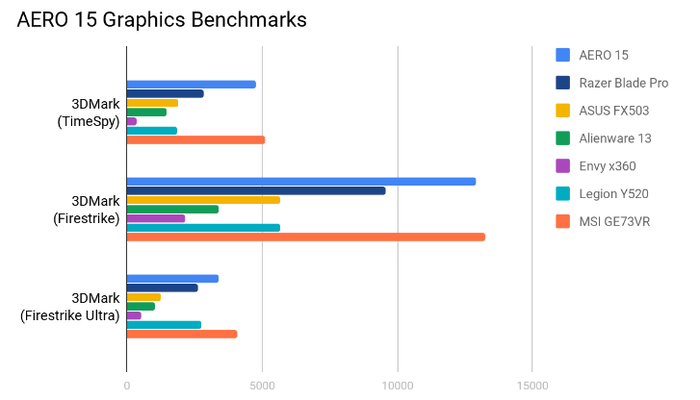 Then, with more graphics-intensive tests, it managed to easily outpace most of the other gaming laptops we’ve tested in recent months. The sole exception here was MSI’s GE73 VR Raider, which makes sense. 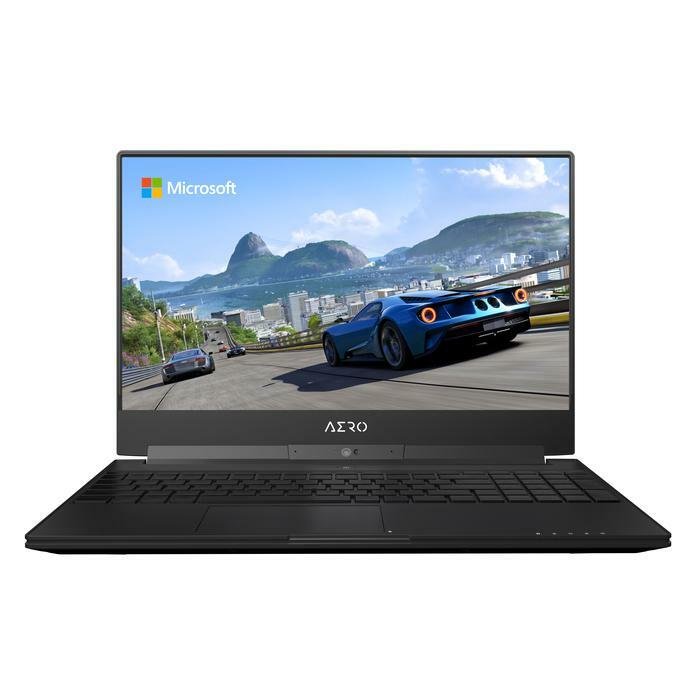 In specs and price, it occupies a very similar space to the AERO 15. 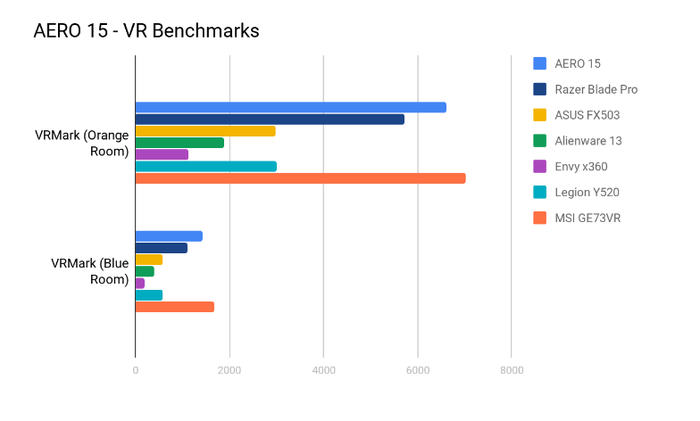 Finally, in terms of how VR-ready the AERO 15 is, it rated quite strongly on this front. It outpaced Razer’s new Razer Blade Pro but - as with the rest of the Futuremark benchmarks - lagged a little behind MSI’s GE73VR. When subjected to the Battery Eater testing tool, the Gigabyte AERO 15 took 4 hours and 15 minutes to dissipate its entire charge. This test is designed to burn the battery down as fast as possible and show off the minimum amount of battery life you can expect. Since everyone’s ordinary usage patterns - and the impact that those patterns will have on your battery life - are going to naturally vary, this is generally a good way to gauge how the battery on one gaming notebook compares to another. Within that context, the AERO 15’s results here stood head-and-shoulders above most of the competition. It delivered significantly longer battery life than most of the other gaming laptops we’ve reviewed in recent months. Usually, you don’t get more than one or two hour. With the AERO 15 we got more than double that. 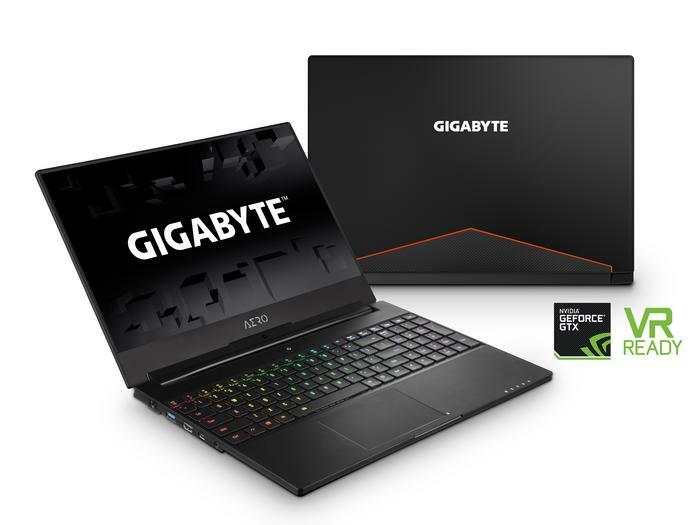 If the experience and specs that Gigabyte were pitching with the Aorus X9 was compelling to you but the price-tag was not. The company’s AERO 15 might just do the trick. It offers up solid and consistently-strong performance in a form-factor that’s as slick to look at as it is to go hands-on with.